Diastasis recti is the result of a larger problem known as functional core weakness. Both conditions contribute to many complications in pregnancy, labor, delivery, and birth recovery. Understanding the connection between your body’s design and the physical demands of motherhood is the first step in rehabilitation. *Although this may look like a list of pretty typical pregnancy complaints, it does not have to be this way. All of these symptoms indicate functional core weakness and risk for diastasis recti. Your core is made up of a group of muscles which are primarily responsible for holding you up and together. The main muscle in this group, the transverse abdominis, is your major postural muscle which holds your organs up and in and provides stability for your spine. However, when this muscle is weak and inactive, it leads to collapsed postures and forces your body to compensate for lack of strength with consistent forward and forceful pressure against the abdominal wall. Forward forceful pressure looks like bracing, bulging, breath holding, bearing down, tensing when straining, and pushing out when in collapsed or in crunched postures. Over time, this habitual outward pressure makes the connective tissue of your abdominal wall (the linea alba) weaker and more susceptible to stretching, causing that midline separation between the right and left sides of the abdominal wall. 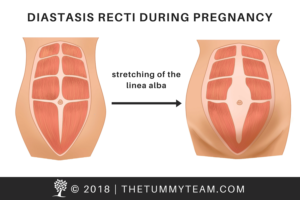 Though pregnancy is not the cause of Diastasis Recti, prenatal women are especially susceptible to this condition because hormones like relaxin create an increased elasticity in the linea alba. (Learn more about the influence of hormones on healing diastasis recti). 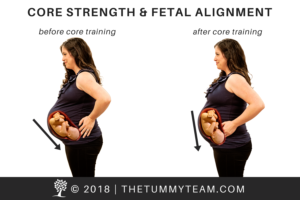 Unfortunately, many women begin their pregnancies with a functionally weak core and the growing uterus adds to the pressure against an already weakened abdominal wall, making diastasis seem inevitable. However, Diastasis Recti is totally treatable, even preventable, during pregnancy. 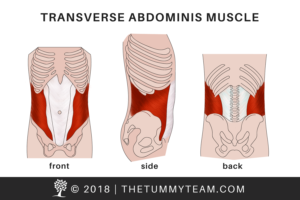 The transverse abdominis muscle is intended to support the uterus during pregnancy and promote optimal positioning for the baby. If the core is too weak to provide the needed support, the uterus tends to tilt forward. This increases the pressure against the linea alba, contributing to Diastasis Recti, and affects overall fetal alignment. Poor fetal alignment impacts the mother by creating added stress on the lower back, upper back, abdominals, hips, and pelvic floor. When the baby is tilted forward instead of aligned vertically, the baby needs to be pushed around a corner instead of straight down the vaginal canal. Contractions can be less effective and labor can stall, creating a lengthy and ineffective pushing phase that includes holding the breath, and curling the body and bearing down. Unfortunately, this continues to place pressure on the abdominal wall and pelvic floor. Prolonged and difficult labor and delivery can result in an increased risk of distress to the baby, perineal tearing, postpartum prolapse, urinary incontinence, and even more severe diastasis recti. (Learn how to improve fetal alignment). When your core is strong and able to support the growing uterus, it places your baby in optimal alignment – head down and aligned vertically with the cervix and birth canal. This position places the least amount of unbalanced stress on mom’s body during pregnancy, alleviating common pain symptoms. But optimal fetal alignment also sets the stage to place effective pressure on the cervix to stimulate and intensify contractions, therefore steadily progressing labor. A strong core during pregnancy creates less pain for mom, less stress during labor, and reduces the chance of diastasis recti. Our Prenatal Core Training program will teach proper upright core activation, postural alignment, functional integration of the core throughout pregnancy, and strategies for effective pushing that minimizes pressure against the core and pelvic floor. If you are planning a Cesarean birth, we can help you prepare the abdominal muscles for surgery and recovery.